Rembrandt's 17th century masterpiece is still inspiring and transforming lives! This book is a testimony to the power of art to inspire and transform lives. It’s really about the essence of Christianity condensed into one, simple parable about two very different sons and one very compassionate father. 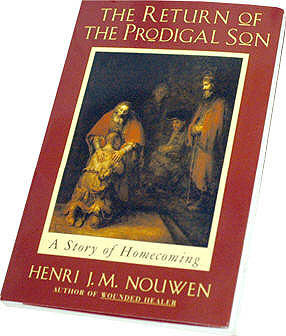 The Prodigal Son is one of the best known of Jesus’ teachings, but Henri Nouwen uses an examination of Rembrandt’s rendition of the parable to help readers analyze many additional elements of spiritual transformation. Beyond a simple explanation of the prodigal son’s spiritual journey, Henri encourages readers to ponder the spiritual challenges faced by all the characters. This is the first book I’ve read by Henri Nouwen, a beloved Dutch Catholic priest, professor, writer and theologian. His distinguished career teaching and lecturing at Notre Dame, Yale and Harvard divinity schools (as well as writing 39 books) took a dramatic turn in 1983 after he encountered Rembrandt’s ‘The Return of the Prodigal Son’ painting while visiting the L’Arche Daybreak community in France. Rembrandt’s masterpiece made a deep spiritual impression upon Henri. Soon thereafter, he was given an opportunity to visit the Hermitage Museum in Saint Petersburg to see the original painting. Following several days contemplating the spiritual implications of this painting upon his life Nouwen felt called to write this book. “Rebrandt’s painting ‘set in motion a long spiritual adventure that brought me to a new understanding of my vocation and offered me a new strength to live it…Moving from teaching university students to living with mentally handicapped people was, for me at least, a step toward the platform where the Father embraces his kneeling son…the journey from teaching about love to allowing myself to be loved proved much longer than I realized,” writes Nouwen. It is said that the last words and works of a man often reflect his most important conclusions and contributions to posterity. 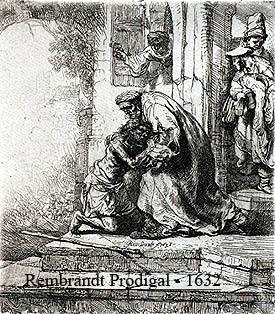 The Return of the Prodigal Son is a perfect example; as one of Nouwen’s final and most popular books, as well as one of Rembrandt’s final and most popular paintings. To understand the full impact of this parable, Nouwen provides readers with the cultural context, explaining the taboo of a son requesting his inheritance prematurely as essentially saying that he wished his father were already dead. “The son’s ‘leaving’ in search of a ‘distant country’ is therefore, a much more offensive act than it seems at first reading. It is a heartless rejection of the home in which the son was born and nurtured,” writes Nouwen. “He wasted his money in reckless living. He spent everything he had. Then a severe famine spread over that country, and he was left without a thing. So he went to work for one of the citizens of that country, who sent him out to his farm to take care of the pigs. He wished he could fill himself with the bean pods the pigs ate, but no one gave him anything to eat. At last he came to his senses and said, ‘All my father’s hired workers have more than they can eat, and here I am about to starve! I will get up and go to my father and say, “Father, I have sinned against God and against you. I am no longer fit to be called your son; treat me as one of your hired workers.” So he got up and started back to his father. -Luke 15: 13-20. “The younger son’s return takes place at the very moment that he reclaims his sonship, even though he has lost all the dignity that belongs to it…it seems the prodigal had to lose everything to come into touch with the bedrock of his sonship – the ground of his being…One of the greatest challenges of the spiritual life is to receive God’s forgiveness…Although claiming my true identity as a child of God, I still live as though the God to whom I am returning demands an explanation. I still think about his love as conditional,” reflects Nouwen. 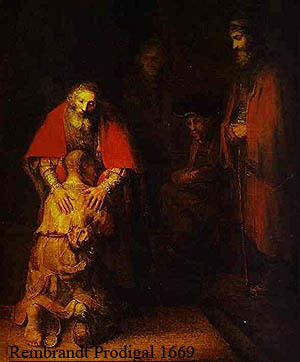 Although the return of the prodigal son is the central event in both Christ’s parable and Rembrandt’s painting, Nouwen sheds new light on the elder son in Part II of the book. Perhaps in part, because a close friend of Henri told him that his life more closely resembled the elder son than the prodigal son, which sparked fresh spiritual reflection upon the topic. Deeper reflection upon the the parable clarifies that both sons have good and bad character traits – which are equally accepted by their father. “The father only is good. He loves both sons. He runs out to meet both. 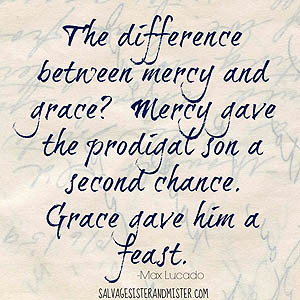 He wants both to sit at the table and participate in his joy…What is so clear is that God is always there, always ready to give and forgive, absolutely independent of our response. God’s love does not depend on or repentance or our inner or outer change,” writes Nouwen. “The story of the prodigal son is the story of a God who goes searching for me and who doesn’t give up until he has found me. “Without trust, I cannot let myself be found. Trust is that deep inner conviction that the Father wants me home…There is a very strong, dark voice in me that says the opposite…without discipline, I become prey to self-perpetuating hopelessness,” concludes Nouwen. 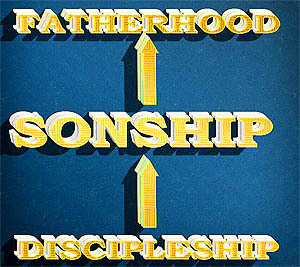 “Then both sons in me can gradually be transformed into the compassionate father. This transformation leads me to the fulfillment of the deepest desire of my restless heart. Because what greater joy can there be for me than to stretch out my tired arms and let my hands rest in a blessing on the shoulders of my home-coming children?,” Henri concludes the book with this insightful question. Nouwen’s book is both autobiographical and devotional. But, it is more than just a devotional book on the Biblical parable of the prodigal son; it is a devotional book on Rembrandt’s ‘Return of the Prodigal Son’ painting as well. He provides an illuminating commentary of Rembrandt’s painting that was only possible in combination with his spiritual insight into the parable. His analysis offers readers a new perspective on this classic parable, revealing why this parable might well have been called “a parable of the lost sons” or “a parable of a Father’s compassion”. Neither the parable nor Rembrandt’s painting clarify whether the elder son eventually confesses his sin or asks the father’s forgiveness. “Unlike a fairy tale, the parable provides no happy ending. Instead it leaves us face to face with one of life’s hardest spiritual choices: to trust or not trust in God’s all-forgiving love,” says Nouwen. Only one thing is certain; the Father’s heart of limitless mercy. I strongly recommend this book for young and old alike. Likely it will end up in my kids and Gkids stocking this Christmas. In fact, I was so moved by both the book and the painting that I decided ordered a print of Rembrandt’s painting from art.com, which presently hangs in my dining room as a daily reminder of the limitless compassion of our loving Creator.